Eleven Americans embark upon an art history tour of Burma planned by their recently murdered friend, San Francisco socialite Bibi Chen. Bibi's ghost follows the group as they make changes to her trip and encounter dangers along the way. 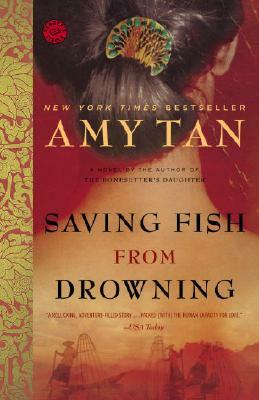 This isn't your typical Amy Tan but I really enjoyed this trip to Burma. Amy Tan is the author of The Joy Luck Club, The Kitchen God’s Wife, The Hundred Secret Senses, and two children’s books, The Moon Lady and The Chinese Siamese Cat, which has been adapted as Sagwa, a PBS series for children. Tan was also the coproducer and co-screenwriter of the film version of The Joy Luck Club, and her essays and stories have appeared in numerous magazines and anthologies. Her work has been translated into more than 25 languages. Tan, who has a master’s degree in linguistics from San Jose University, has worked as a language specialist to programs serving children with developmental disabilities. She lives with her husband in San Francisco and New York.